It's that time again, doing the 'should-be-annual' re-setting of my insurance coverage for the art collection. Those prints can go for 4k+. I'd insure it for at least $50k. That probably means you will need to get an appraisal to satisfy the underwriter. jjttdw wrote: Those prints can go for 4k+. I'd insure it for at least $50k. That probably means you will need to get an appraisal to satisfy the underwriter. Fortunately, I go through Chubb, so no appraisal sub-$250k. I think it would be interesting trying to find a licensed appraiser for the urban art genre. $50K is low for insurance value IMO. Id set it at $100k minimum. Not saying it hits that at auction but I wouldn't be surprised and you probably want to err on the side of caution. mose wrote: It's that time again, doing the 'should-be-annual' re-setting of my insurance coverage for the art collection. I'll just jump in here and say what I always say, but with a nod to what's being discussed above. 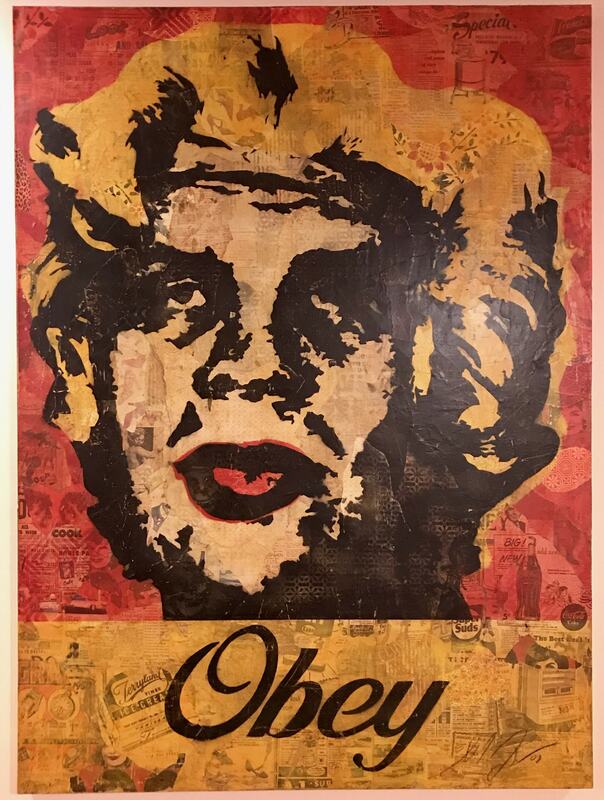 Yes, if this goes to auction today I guess it would hit the usual auction prices for comparable Obey canvases. But what I might actually do is compare this to the pricing around the large Miami Peace Goddess canvas from a few years back during the Jason era. Yes, that one is much larger, but this image is as/more desirable. So what does that piece go for? And how much did the mega-large Suit Canvas from Art in the Streets Show go for? That aside, this has to be one of the top three canvas' he's made, so yes, $100+ at least, but $250k "feels" more right. Knowing that down the road, it will blow those numbers out of the water. Sorry for the ramble. Hope the thoughts help. Hey guys. Been almost two years, so time to update my insurance valuations again. What would you peg the Marilyn at? mose wrote: Hey guys. Been almost two years, so time to update my insurance valuations again. Why GO through all that headache of dealing with a insurance agent that does not a a fudicary best interest in mind. just sell it to me and forget it all. problem solved. oh wait.. I dont have nearly enough money to buy something of this epicness. Perhaps I could buy a 1/12th share? at least $150K. and just out of curiosity do you have it framed? stored? that thing is amazing. no1gdman wrote: at least $150K. and just out of curiosity do you have it framed? stored? that thing is amazing. Not framed, need to get one of the wood ones some day, but up on the bedroom wall. It continues to freak out my young daughters every once-in-a-while.